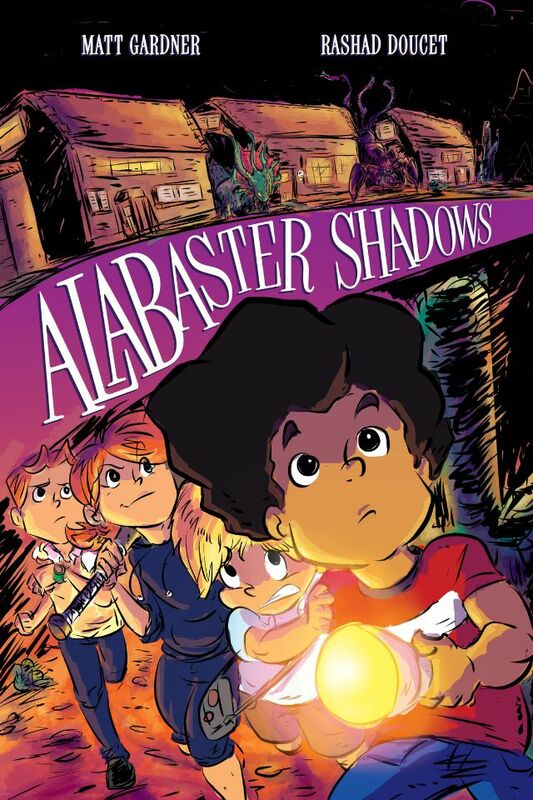 The cover of Matt Gardner and Rashad Doucet’s Alabaster Shadows, available now as part of Black Comics Month. MizCaramelVixen is the founder of VixenVarsity.com and BlackComicsMonth. Now in its second year, BlackComicsMonth celebrates black creators as well as comics featuring black protagonists, and works with publishers to give away books that showcase black excellence in comics. Via email, MizCaramelVixen took the time to answer The Mary Sue crew’s questions about how Black Comics Month got started, how fans can participate, and where we can get our hands on some awesome free comics. The Mary Sue: Before we talk about BlackComicsMonth, you’re also the founder of VixenVarsity.com. For anyone who’s not familiar with VixenVarsity, can you explain the concept behind the site and what inspired you to start it? MizCaramelVixen: VixenVarsity.com is a lifestyle website that focuses on diversity in media, it launched January 1st 2014. There aren’t many lifestyle websites out there that are run by African American women. I decided to create a site that featured recipes, comics, sports, technology, music, tv/movie reviews, parenting and of course mental illness. There are many in the black community whose hobby is more than just one thing, including my own, so I figured if you don’t see something you want, create it yourself. TMS: What initially inspired you to launch BlackComicsMonth, and how did you first begin finding support? Did it start as a hashtag? Vixen: Two weeks into January 2015, Milestone 2.0 was announced and I saw on Twitter several people, they could have been trolls…but who knows, and they questioned whether or not there were black superheroes. The fact that these people never heard of Vixen, Storm, Black Panther, Luke Cage, Mr. Terrific, Misty Knight, etc was a bit alarming to me. Then it dawned on me if they didn’t know the superheroes, they probably didn’t know black comic creators existed. And just like that, BlackComicsMonth was born. I already had a connections with publishers from VixenVarsity.com and my Twitter account, so I reached out to them and asked several publishers to support BlackComicsMonth and become a sponsor. Gail Simone was very instrumental in getting the word out about #BlackComicsMonth. BlackComicsMonth started out as feature on VixenVarsity.com, the BlackComicsMonth.com website was not functioning at the time, and from there, the hashtag took on a mind of its own. TMS: This is the second annual BlackComicsMonth. How has the response you’ve received, both from fans and from publishers, changed from year one to year two? Vixen: Yes it is! I’m so excited that this is our second year, it’s insane. Publishers didn’t realize that #BlackComicsMonth was going to reach this magnitude and neither did I, to be honest. I never thought that I would have panels where Afua Richardson, David Walker, Chad L. Coleman, Mikki Kendall would be in attendance, let alone Greg Pak, Brian Michael Bendis and Scott Snyder. The bigger the names got for the panels, the publishers wanted to be involved and had no hesitation donating comics to the panels. The very first day of #BlackComicsMonth 2016, the impressions were over 3M on my main Twitter account alone; I run 3 accounts. It’s safe to say that many people are interested in black comic creators. I just really and truly hope that they’re out supporting these creators. TMS: How significant a role did social media play in getting BCM off the ground? Vixen: HUGE! Image, Marvel, Dynamite, BOOM, Dark Horse all have used the #BlackComicsMonth hashtag to spread awareness of black creators and characters. Buzzfeed, AVClub, BlackSportsOnline, and The Washington Post have all featured BlackComicsMonth, which they saw trending online at some point. TMS: I can only imagine all the planning and hustling that goes into creating something as epic as BlackComicsMonth. Do you experience any personal burnout? Is there any advice you’d give to someone trying to get a similar event off the ground? Vixen: I’ve been pretty much pulling my hair out since January. It can get truly overwhelming, I suffer from anxiety and this is doing wonders for it. Advice? Whew. If you’re going to attempt this and post every single day, try to at least get a week of posts scheduled, so you have some wiggle room. Not only do I have to create the posts, I have to go through and send emails, on top of promote the posts throughout the day and find more creators to have lined up for the next week. Just because you send out emails to the creators, it doesn’t mean that you’ll get them back in a timely manner as they are working on their own projects. Be patient, breathe, walk away from the computer and remind yourself why you’re doing what you’re doing and pulling your hair out is completely worth it. TMS: What can creators or fans who want to support/participate in BlackComicsMonth do to help out? Vixen: Fans can help spread the word of black creators by opening up their wallets and spending money. Likes and RTs are all well and good, but if you’re not spending your money and investing in these talented creators…I feel sorry for you, you’re missing out on some amazing and talented people. As for the creators, I just want you to keep up the fight. Write and draw your comics, don’t let anyone tell you what story you can and can’t tell. You’ll always have my support. TMS: What comics do we have to look forward to for the rest of February, and what is the best way for fans to get their hands on them? Vixen: I can’t spoil the lineup, but we do have more webcomics and comics by women and men that can be purchased via Amazon or Comixology. Also check out Kickstarter, there are several kickstarters created by black comic creators that are just waiting for you to pledge. TMS: Do you have any personal comic recommendations for fans who are looking to read titles from a variety of diverse creators? Vixen: I found this gem of a webcomic titled “Alone” sitting in my inbox by Olivia Stephens, it makes me tear up big time. Khalid Birdsong’s “Fried Chicken and Sushi” is a comic strip that chronicles the journey of the author from Atlanta to Japan. “Princess LovePon” by Shauna Grant is such a cutesy and fun webcomic. James F. Wright’s “Nutmeg” is still going on strong – think Mean Girls meets Breaking Bad. TMS: What do representation and diversity mean to you, personally? Vixen: As a black, queer, disabled, plus sized woman suffering from mental illness, I am the epitome of a diverse person. I need to be represented all the way around, not just because of my race or gender. I want to see comics featuring a full figured disabled black woman who’s suffering from depression that has a gorgeous girlfriend who supports her choice to be a runway model. Anything is possible; if you can dream it you can achieve it. TMS: Do you think there will ever stop being a need for a designated Black Comics Month, or do you think there will always be a reason to set aside a time to celebrate specifically Black creators? Vixen: BlackComicsMonth coincided with Black History Month and that will always be celebrated. Every time a black creator creates a comic, it’s a part of Black History. I think that all creators of color should be celebrated. TMS: Is there any advice you’d give to creators writing a protagonist that’s outside of their own lived experience, for example a white male creator writing a Black woman protagonist? Vixen: Anything can be created, but just know your subject. Not all black women are angry, loud and black. We all don’t have our hands on our hips all the time and roll our eyes. Don’t make your subject material stereotypical, it’s not tolerated. Also, just because it might be in line with a certain era, how about we refrain from using the N-word in comics. TMS: Do you have any interest in creating a comic of your own down the line? Vixen: Well actually, I just handed in my script for Taneka Stotts’ Elements Anthology, which will be headed to Kickstarter sometime this year. I’m also submitting a few pitches to other anthologies this month, on top of working on a comic with a NY Times bestseller, which is so exciting! TMS: What can we expect to see from BlackComicsMonth in the coming year, and how can readers/publishers stay involved?